Drayton postmill was one of a pair of mills on the same site. One was a smock mill, which is said to have been moved from Hellesdon, where it has been noted that the smockmill was blown down there in 1842. The other windmill was almost certainly a postmill. In 1851, Jeremiah Howard was given as a miller and timber merchant aged 37 living in Drayton with his wife Sarah, 36, and also his nephew Frederick Butcher Randall, 17, and niece Maryann Howard, 11. Jeremiah Howard was born c.1814 in Hellesdon, Norfolk and Frederick Randall was born c.1834 in Taverham, Norfolk. Jeremiah Howard was listed in White's Directory of 1854 and Melville's Directory of 1856 as a flour and saw miller and also in White's Directory of 1868 as a corn and saw miller. Jeremiah Howard died in March 1887. In 1881, Jeremiah Howard was given as living at 1, Upper Drayton Road, Drayton with his wife Emma, 38, and daughter Annie, 20. 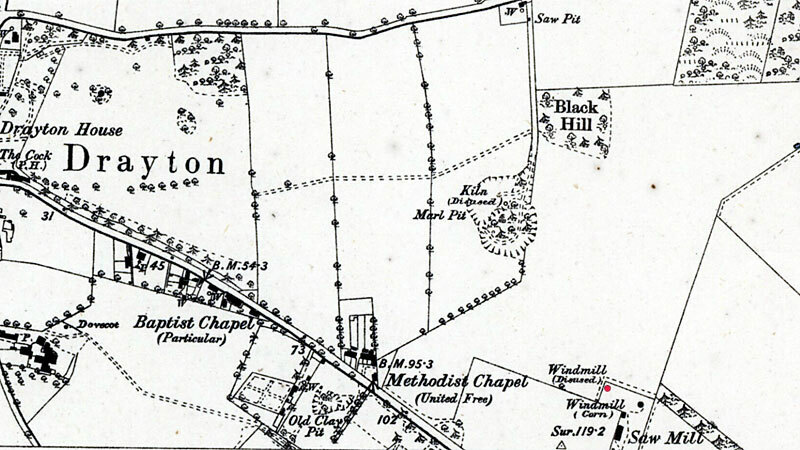 The mill was marked on the 1885 Ordnance Survey map. HOWARD. - On the 29th ult., at the Mills, Drayton, Jeremiah, the much beloved husband of Emma Howard, aged 73. GOOD OPPORTUNITY TO SMALL CAPITALISTS. ALL that well-known old-established BUSINESS, recently carried on by the late Mr. HOWARD, sold in consequence of his decease, situated in Drayton, near Norwich; the Engines, Boiler, Horses, Wagon and other Plant and Carriages, with the Stock-in-Trade, to be taken by valuation. - Apply to Messrs. Hunter, Auctioneers, St. Andrew's Hall Plain, Norwich. The mill was dismantled after Jeremiah Howard died, as a pair of French stones and some mill sails were included amongst the plant disposed of by auction in July 1887. It would seem that Jeremiah Howard had been running the smockmill to produce flour and was using steam engines to power a sawmill. About Three-quarters of a-Mile from Drayton Station. A CIRCULAR SAW TABLE, for a 40 in Saw, with Carriages and Tramway, another valuable Circular Saw Table, a Number of Circular and Other Saws, Boiler Guages, &c.
TWO POWERFUL HORSES, Carriages and Farm Implements, comprising: - A Norwich Pony Car, Vis-a-vis Pony Phaeton, Luggage Cart, an excellent Road Waggon on Springs, Tumbril, Two capital Timber Drags, Water Cart, Several Iron Tanks, Horse Roll, Plough, Harness, Chaff Engine, Root Pulper, &c.
Timber and Outdoor Effects, including a Pair of 4-ft French-Burr Mill-Stones, Mill Sails, Timber, Timber Ties, Plank, Scantling, Boards, Hurdles, Timber Jack, Racket-Brace, Tools, Chains, Wrought and Cast Iron, &c.
MESSRS HUNTER have received Instructions from the Executrix of the late Mr. J. HOWARD, Steam Sawyer, Drayton, to Sell by Auction the above Property, upon the Mill Ground, at Drayton, on Monday, July 11th, 1887. The sale will commence at Twelve o'clock. Catalogues of the Auctioneers, St. Andrew's Hall Plain, Norwich.